Here is a piece I recently completed using gold paint as a base for Bishop on Bedford Gallery in Brooklyn N.Y. 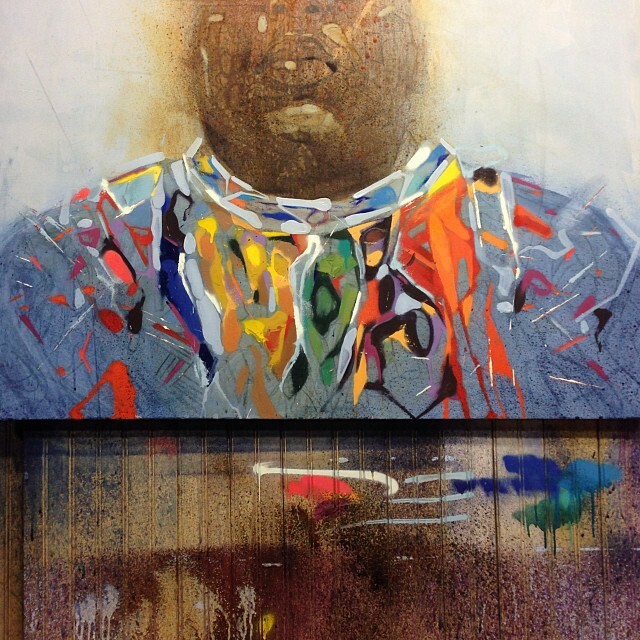 They are hosting a group art show curated by the legendary DJ Clark Kent for the 20th anniversary of Biggie's debut album 'Ready To Die'. This is my remix based on the original album cover. Will there be prints? Of course there will so stay tuned. The following are some step by step photos of my process in creating a recent piece for my upcoming show at Cukui. For the most part, I try to avoid painting portraits of celebrities because I feel the work may lack a sense of wonder, and mystery. I also worry if people won't see passed their mental image of who the iconic figure is. Most times I prefer anonymous faces to begin paintings with because I use them as a starting point. I usually try to keep just enough to highlight a certain expression. This sensibility is probably from my experience through graffiti where you basically tweak and reinterpret legible typography based on your feelings and movement. Well for my current show, I am going against my usual thoughts on portraiture. For a while now i have been wanting to paint a series based on various musicians through my own artist lens because music has provided so much inspiration and therapy for me. Due to my own prejudices on this type of portraiture I have avoided it. But damn it, sometimes you just gotta let it out! I hope to go past what a photograph can capture by absorbing a feeling and releasing it through the work. Who is The Notorious B.I.G.? Certainly I don't know. Is he a Coogi pattern with shades, and a crown? I started with these elements, which are so very graphic as visual identifiers, and decided to abstract them and find new forms and compositions. I'm not sure what you get from it as I cannot dictate your feelings but I definitely stumbled onto some unexpected results and stopped the painting at a place that I feel is new and interesting. Enjoy! Sketch for an upcoming private commission of Capoeira master Mestre Acordeon. face but instead are more drawn to a feeling. Stay posted for pics of the paintings. Sketch for a painting and capsule collection I am working on for Cukui. Will post details as they arise. I am very honored to announce that I have been invited to paint a couple of walls at the Oakland Museum of California as part of their upcoming Dia de Los Muertos exhibit. The exhibit will focus on both Dia de Los Muertos, and natural sciences, especially in regards to our state of California. Above are my concept sketches for the walls. A little info on the bear drawing: I learned that in some Mexican traditions, everyone is born with a spirit of an animal who is responsible for protecting and guiding us. These are called Nahuales. The Grizzly Bear can be thought in this way about our state, which may be the reason it is pictured on California's flag. That's why I decided to make a dedication to the animal which unfortunately and ironically is now extinct in our state. I will post more information about the other image pictured here, and some of the visual ingredients I chose as the work developes. Stay tuned!